Janet Mendel describes corvina as a bland tasting fish which benefits from a sharp sauce. In “Cooking in Spain” she has a recipe for Corvina en salsa de alcaparras (Meagre in caper sauce); the fish is baked in white wine and the sauce includes capers, blanched toasted almonds, spring onions, olive oil and garlic. The recipe is one which I may try next time and she suggests it is also suitable for hake or grouper. 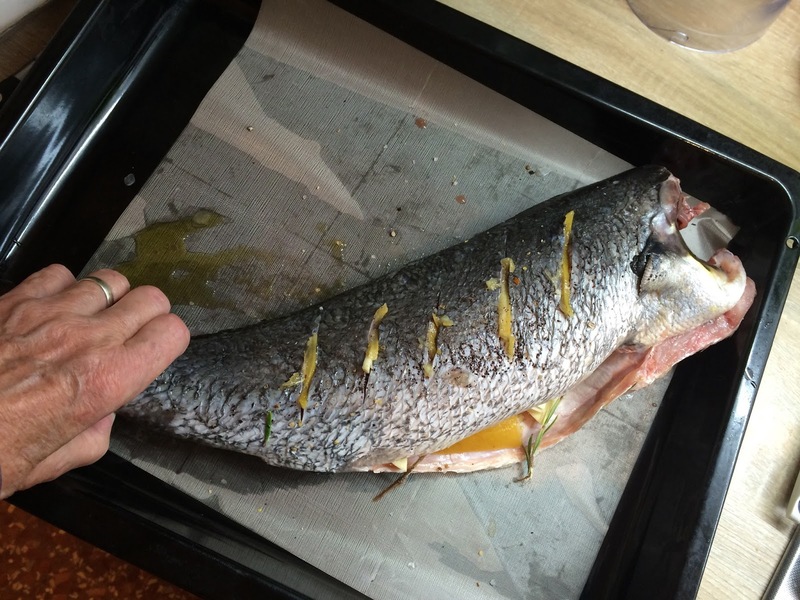 Alan Davidson (Mediterranean Seafood) suggests treating it as a rather large sea bass, and since I think fish is almost always better cooked whole, on the bone – and looks impressive at a dinner party, I decided to cook it roasted whole. It weighed over 2kilos so I did ask the fishmonger to remove the head as I feared, correctly as it turned out, that it wouldn’t quite fit in the roasting tray with the head on. We were only four for dinner. Sylvi says that I underestimate how much fish people eat and as Alan Davidson recommends corvina as a fish that can be eaten cold, I wasn’t concerned that it was too big. The advantage of corvina cooked on the bone is that it doesn’t have any small bones and it is easy to serve bone-free portions when cooked. There were some leftovers and tasting it the following day, I can confirm that it is an excellent fish to be served cold in a salad, perhaps with a garlic mayonnaise. The flesh is firm when cooked and even firmer when cold, almost with a chicken breast texture, so maybe a salad next time, but on this occasion I decided to make my version of Thai fishcakes. On this occasion I roasted it, uncovered. Peel of one preserved lemon or thinly pared peel of a fresh lemon. Preheat the oven to 180°C (160°C). Have the fish scaled, gutted and cleaned. Make four or five deep slashes on each side of the fish and sprinkle inside and out with sea salt (if using lemons preserved in salt, go easy on the salt; rub the fish with oil and sumac, and force slivers of garlic, strips of lemon and a few rosemary leaves into the slashes. Put the remaining sprigs of rosemary, any remaining garlic and lemon peel into the body cavity and place in a roasting dish in the preheated oven for app 30-40 minutes,– the skin should be crispy and peel off easily and the flesh should be white and flaky. Serve with any juices from the cooking, with a squeeze of fresh lime or lemon and garnished with fresh chopped parsley.